The birth of the metal experiment. 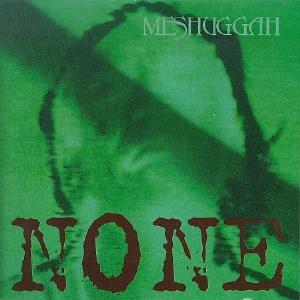 Meshuggah - progressed. The band's first real outreach towards a more complex and progressive sound, None is a bit more laid back approach from their first progressive studio approach in Destroy Erase Improve. However, for those not adjusted to this band or this sound, it won't seem as such. It becomes clear very quickly how much this band has to offer. The only comparison I can make to the lead guitar sound is Allan Holdsworth, which is really saying something. However, it's Allan with an unhappy childhood, as evidenced by the dense riffing and distortion. Haake's drums are not as impressive here as they would be on other albums like Chaosphere, but you can already tell how much different his style is to others in the field. Sickening is the best track here, sounding most like a DEI track but has a very nice clean section to go with it. A great EP to have. The only downer to this is the vocals, which are not near as robotic and structured as they would become later (trust me, you don't want a lot of variety with the vocals with this style of music). For those that can stomach the initial sound, there are enough tricks and turns to keep yourself entertained.